For Eric Danell, there is no other job he would have enjoyed better than the one he has had at Heartland Fire and Rescue. Well, almost no other. “Besides flying a fighter jet, I can’t think of anything else I wish I had done,” he said. Piloting loud, powerful machines seems to be Danell’s forte. Before being promoted to captain 10 years ago, he was an engineer for Heartland Fire & Rescue and drove fire engines. “It’s the best job in the department to have,” he said. 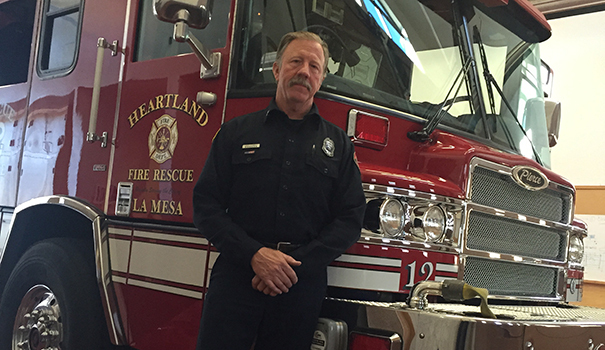 This month, Danell will retire after 31 years with Heartland Fire. “I figure it’s time to move on to the next phase,” he said. That phase will involve fishing and supporting his wife’s horse training business. Some aspects of firefighting have changed and others have stayed the same since Danell first visited a firehouse with his brother years ago and decided to leave San Diego State University and pursue fire science at Grossmont College. Also, the equipment for firefighting has improved, he said. Fire trucks today are stronger, faster and can pump better, but the biggest advance is the addition of computers. “We are able to access information that we never could have in the past,” he said. Knowing the layout of a building and, more importantly, what kinds of possibly hazardous materials are on a fire site gives today’s firefighters an advantage they didn’t have when he first started, Danell said. But, he said, firefighting’s core is still the same. Although Danell has fought many fires on the job, it was during a wildfire while he was off duty when he came closest to dying. During the Cedar Fire in October 2003, Danell was off duty and traveling throughout the county to help where he could. He and another firefighter who was also off duty went to Julian to check on a retired fire chief who lived there. The wildfire headed that way and eventually reached them at 11 p.m., he said. All they had was a small pump with two hoses connected to a water tank, but only one hose could run at a time. Although the pump ran out of gas and Danell had to refill it while lit embers rained down around him, the three made it through the night and the retired fire chief’s house was the only one that survived in the area. Danell was born in New York and has cousins and uncles who work as firefighters there. After the 9/11 attack on the World Trade Center, his department raised $20,000 for a widow of a firefighter from his uncles’ department by holding fundraising drives like selling T-shirts at Oktoberfest. He went back to New York to deliver the money and attend funerals of fellow firefighters, thanks to the La Mesa community pulling together to show their support. There is no doubt that fire fighting can be dangerous work. And I think everyone appreciates what fire fighters do. Do firefighters die every day? I don’t know for sure. But the US Bureau of Labor Statistics Fire Fighter Fact sheet for July 2013 states” Over the past 4 years, an average of 31 firefighters were killed on the job each year” and “The 2011 fatal injury rate for firefighters was 2.5 per 100,000 full-time equivalent workers, compared with 3.5 for all occupations.” To be fair, it is also true their injury rate is about 4 times the national average. But just maybe some perspective is helpful too. Here are some other fatal injury rates for lesser known occupations from the same source. I do truly appreciate fire fighters, but I am also grateful for the many other, less glamorous and non public employee occupations, who are put at risk to help our lives be better. The average California firefighter is paid 60% more than paid firefighters in other 49 states — and that’s not counting the 70+% of America’s firefighters who are VOLUNTEERS. CA cops are paid 56% more. Yet the CA 2011 median household income (including gov’t workers) is only 13.4% above nat’l avg. It makes little sense for a firefighter to work past 30 years. Their pension usually maxes out at 90% of their highest pay after that time frame. Indeed a firefighter makes MORE after they retire than they received in their working salary paycheck. A person working has paycheck deductions. Notable are pension contributions (typically 9% of pay), union dues, plus a couple other odds and ends. Not to mention the commuting costs. And let’s not forget that quite a number of retired public employees — especially police and firefighters — “go out” with a disability designation (usually for common middle age infirmities, usually sports injuries), which means that up to half their pension is free from federal and state income tax. Depending on circumstances, that exemption cuts one’s income tax bill by 60% o 80%. Sweet! Yes, most career CA public safety workers are literally set for life — without putting a dime aside for retirement on their own. Thanks for all your important, and so relative, statistical information Richard and Scott. The Bureau of Labor Statistics does not consider heart attacks and some other causes of death as job related but the U.S. Fire Administration, Worker’s Comp and others do. They consider an average of 100 per year die on the job. Congratulations to Eric for his 31 years of dedication to the City of La Mesa and its citizens. So what is your point Richard Rider? That the other regions of the USA are so far behind? All you are throwing out are dollars and cents when you have nothing to say about the high level professionalism of firefighters in Southern California. I remember when I left San Diego years ago how much your rhetoric had become a joke. Seriously, how can you compare the training of a volunteer to that of a professional. And, if you are talking fiscal sense it is beneficial to the public to to have a public employee stay beyond their eligible retirement date. Until then you are just another of the unobjective voices that seem to breed in San Diego County. Saludos from Mexico and props to a guy who has served the public in myriad ways and earned a well-deserved retirement. Uh huh. So you think CA firefighters are worth 60% more than the PAID firefighters in the other 49 states. What is your basis for such an absurd assumption? Rah rah cheerleading notwithstanding. I’m glad I’m a joke with firefighters. Seems they can’t figure out any other way to refute my points. Clearly YOU have nothing to offer in response — a response devoid of content. BTW, the city of San Diego now provides 401k retirement (not your guaranteed pension) for our recently hired city firefighters. The city has yet to burn down. Care to denigrate your fellow firefighters working under this plan? BTW, glad to hear that apparently you’re doing well in Mexico with our pension money. At least you’re stimulating SOMEBODY’s economy. Certainly not ours. And, oh yeah, also avoiding the CA income tax you so mightily worked on raising while a firelighter. Typical. Oh Richard Rider, as always you are so ill informed. Yes, firefighters won’t have to pay their 9% retirement contribution when they retire. But they will have to buy health insurance, which is not a retirement benefit. Why not focus on Congress with their lavish post-retirement benefits instead of the brave people who do a job you apparently never could? Not sure of the standards for the Labor Statistics numbers but every year an average of 100 firefighters die each year. The difference between those and other jobs is that the other jobs fatalities are due to on the job accidents while firefighter deaths are an understood risk that comes with the job. Few roofers, cab drivers etc, go to work knowing that they could easily find themselves in a career ending environment within minutes of walking in the station. Oh and never mind the fact that this was an article about an honorable man who dedicated his career to public service but that’s ok, let’s make it a platform to bash public employees. Hey Richard Rider, you could have at least thrown in a “thanks for 31 years service” but I guess that’s asking too much. Gee Frank, retired at 47, and living the cushy life in deep Mexico as a permanent resident. I’m here, 65 with no hope of retiring because I have owned a private business for longer than you were a fireman. I would think a simple ” thanks” would be more appropriate. Congratulations to Capt. Eric Danell for your service! I appreciate our local firefighters & police/sheriff officer & deputies. When I see an article like this with some picking apart stats (injury/fatality rate), or questioning pay and pension, I wanna say you must be jealous you did not pick and qualify for such a nice career!